Milwaukee has come out with a new Door Lock installation kit that makes it easy to drill the holes you need to install door hardware. 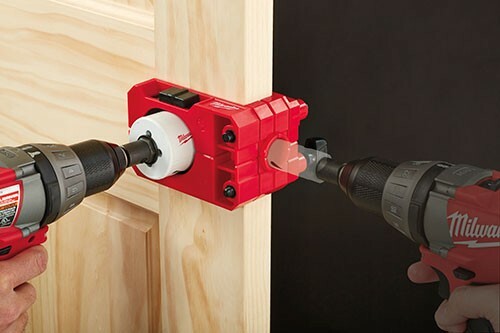 The drill guide easily adjusts and self-centers to fit 1-3/8" to 1-3/4" door thicknesses and adjusts to 2-3/8" or 2-3/4" backsets. MILWAUKEE, WI – Milwaukee Tool Corporation continues to provide time-saving solutions for the professional with the introduction of the new Door Lock Installation Kit. Featuring Milwaukee's renowned Ice Hardened™ Bi-Metal Hole Saws, the kit is designed to provide Professional Remodelers and MRO users an accurate and easy-to-use solution for installing locksets and deadbolts on doors, while solving the common frustrations users often face with existing kits on the market. "Other door lock kits on the market are often difficult to use and not very durable," says Ed Lau, Product Manager for Milwaukee Tool Corporation. "Our new Door Lock Kit features high-end professional features at a competitive price to deliver best-in-class performance and value." Available in September 2013, the new Door Lock Installation Kit demonstrates Milwaukee's continued commitment to delivering innovative accessory solutions to save time and increase productivity on the jobsite. Believe it or not, the Milwaukee Door Lock Drill Kit was one of the tools I was most excited to see announced at the Milwaukee Media Event. A good door hardware drilling guide is not easy to find in today's market. You either have something that is too cheaply made to last, or you can find one made of metal that weighs 5 pounds. Hopefully what Milwaukee is bringing to the table proves to fall in the middle or better. The price isn't too bad at around $35.